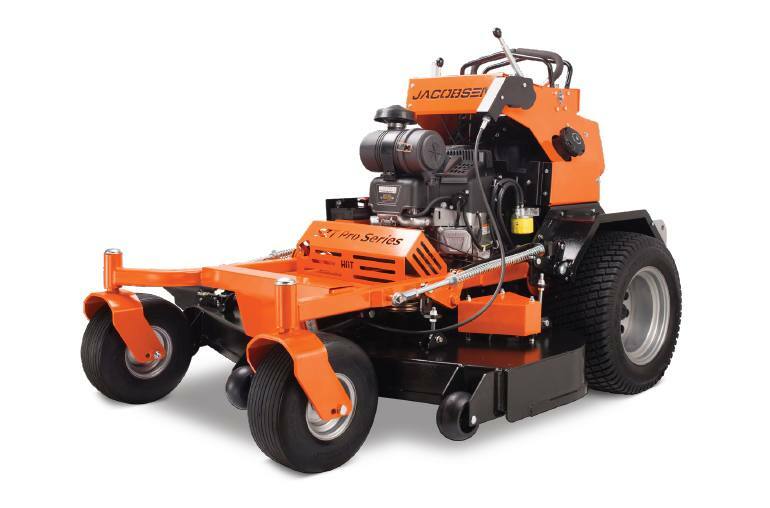 Jacobsen is proud to introduce the SZT Pro Series Stand-on into our commercial line-up. Our newest mower packs power in a small footprint. All Muscle - The new Vanguard® 810cc series provides power and performance in a heavy-duty 26 horsepower engine. Compact Stand-on Design - The SZT's small footprint allows it to maneuver in tight areas and take up less trailer space. Industrial Strenth - Forged from 7-gauge steel, the SZT is built for the rigors of commercial mowing. Versatile Design - Flip up the operator platform to use the SZT as a conventional walk-behind, giving you more mowing options. Deeper Deck - The deep deck features a 7-gauge steel shell and can easily handle large volumes of grass without slowing you down. Built-In Footsteps - Allows you to shift weight balance for better traction along hillsides. Overall width (with chute up): 49"
Overall length (platform down): 79"
Engine horsepower is provided by engine manufacturer. Actual operating power output may vary due to conditions of specific use.